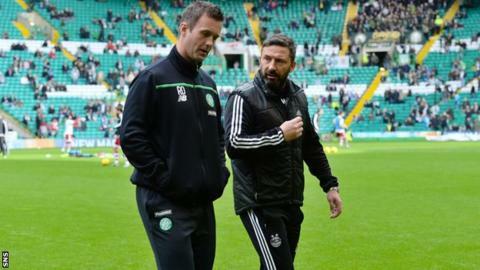 What changes might Ronny Deila and Derek McInnes make to their squads in January? The festive period brought a flurry of games and occasional slight shifts in the dynamics of the three highest-profile competitive zones of Scottish football. It is too early to make judgements about who will win the Premiership and the Championship, and which teams will be relegated from and promoted to the top flight, not least because January provides a vital opportunity for clubs to improve their prospects. There is not enough money in Scottish football for wholesale changes but clubs can wheel and deal enough in the market to make use of this transfer window, even if some of the business might be prompted by a bout of anxiety. Celtic remain prone to contradictions. They have the greatest resources in the Premiership and the most accomplished squad but performances have, at times, been flat. Fighting spirit was evident in the 2-2 draw at Tynecastle two days after Christmas, but it took a late Leigh Griffiths goal to overcome Partick Thistle on Saturday. One or two new signings would freshen up the squad and its mood but the tendency under manager Ronny Deila has been to sign young players with potential - players that typically take time to adapt and develop. Ryan Christie is now in Deila's squad, having joined in the summer and then been loaned straight back to first club Inverness Caledonian Thistle. However, the 20-year-old could find himself in the same situation as fellow midfielder Scott Allan, 24, in trying to force his way into the team from the sidelines. Griffiths provides a regular supply of goals but Nadir Ciftci and Carlton Cole lack the Scot's vitality and neither has looked persuasive. Another striker, one ready to lead the line for the first team, would bolster Celtic's title challenge, as would a battle-hardened centre-half. Aberdeen might have overtaken Celtic for a spell at the top of the Premiership but draws against Partick Thistle and Inverness Caledonian Thistle have left the Pittodrie side three points behind Celtic, with the leaders having one game in hand. Derek McInnes's squad has strength in depth but with Shay Logan nearing the end of his contract there is the desire to sign a new right-back and the Dons have been linked with Dundee United's Ryan McGowan. Another attacking option would also surely be welcomed by the manager since Niall McGinn and Johnny Hayes remain particularly important players because there is little back-up out wide. Hearts are six points adrift of Aberdeen but still have ambitions to finish second. Having upgraded the team last summer, adding defensive nous and some midfield dynamism in Arnaud Djoum, head coach Robbie Neilson would consider a centre-forward as the priority. The busiest club in the top flight could well be Premiership bottom side Dundee United, since trying to stave off relegation requires a drastic turnaround in their form. The Taysiders have won only twice this season and Mixu Paatelainen has already signed four players for the spine of this team - a goalkeeper, centre-back, midfielder and striker. The squad needs more experience and stronger personalities since there is an issue with confidence and mentality that has led to them taking the lead in five of their last seven games but failing to win any of them. Paatelainen is limited in terms of budget and the players who are available but the team needs bolstered at the back and up front. Kilmarnock and Hamilton, who are currently the teams above United, have less specific areas to address, although both would welcome additional help. The issue for United is that even when signings arrive, free agents have tended be short of match practice. The one commodity United cannot buy is time. Rangers have regained the edge in the Championship title race following their victory over Hibernian shortly after Christmas. The Ibrox side have also added to their player pool, signing squad players in goalkeeper Maciej Gostomski and winger Harry Forrester. Accrington Stanley duo Josh Windass and Matt Crooks could also sign pre-contract agreements, but the expectation remains that Mark Warburton will look to add a central midfielder of presence and experience as well as a centre-forward with the attributes to play up front on his own. Alan Stubbs has also added to the Hibs squad, signing defender Niklas Gunnarson on loan and forward Chris Dagnall. Hibs, who are third, are well served in central midfield but strikers Henri Anier and Islam Feruz have made little impact and could be replaced by other loan signings. For Falkirk, in second place on goal difference, the achievement this month might be holding on to some of their young talent. Rangers have been linked with Will Vaulks, while Blair Alston and Craig Sibbald have long been admired by suitors.